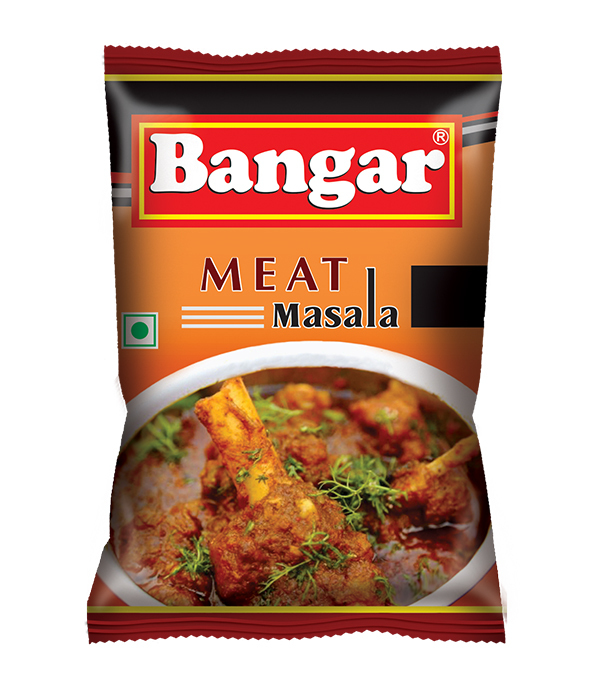 BANGAR MEAT MASALA is a unique blend of of pepper-coriander-chilli with other spices that adds hot taste to non-veg dishes, especially meat. USAGE : Used in preparing Meat dishes. As only spices are used in preparing Meat Masala it can also be used in vegetarian dishes which requires a spicy touch. Ingredients : Anistar, Bengal Gram, Black Pepper, Cardamom, Cassia, Cassia Leaf, Chilli, Clove, Clove Leaf, Coriander, Cumin, Dry Ginger, Fennel Seed, Garlic, Kasuri Methi, Mint Leaf, Mustard, Turmeric & Common Salt. 9 grams Pouch 1200 9.600 Kg. 15 grams Box 300 4.500 Kg.